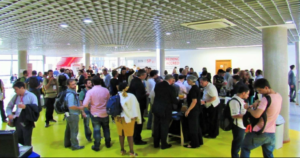 The Business & Innovation Network’s 2016 event – BIN @ SP2016, took place in São Paulo, Brazil, and aimed at strengthening relations between the partners from academic and business worlds through the actions related to innovation and entrepreneurship. The BIN@SP was organized by the University of São Paulo Innovation Agency (AUSPIN), in partnership with the University of Sheffield and the University of Porto. The event took place at the International Broadcasting Center (CDI) and at AUSPIN facilities, both located in the Butantã neighborhood in São Paulo. The event was attended by 677 participants and speakers from 30 countries on five continents.